Oswego, NY – Despite an overcast morning, racers and fans alike arrived at Wright’s Landing early Sunday to participate and watch Oswego’s first nationally sanctioned triathlon. 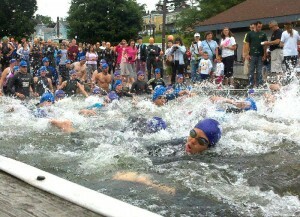 A large crowd watches as the swimmers dive into Lake Ontario. More than 250 participants registered for the event with experience ranging from first time triathlon participants to seasoned veterans. There were two different courses set up to accommodate the different skill sets. The sprint course consisted of an 800-meter swim in Oswego Harbor, a 13-mile bike course and a 5K run. The intermediate distance event consisted of a 1,500-meter swim, 24.9-mile bike course and a 10K run. In order for the racers to safely bike and swim through town, police were posted throughout the course to stop motorists from driving on or through it. In the sprint race the best time was 1 hour 9 minutes and 47 seconds by Brad Depoint, a 29-year-old from Fulton. The best time on the intermediate course was held by Frederic Boivin, a 22-year-old from Oswego, with a time of 2 hours 11 minutes and 36 seconds. This triathlon was a first for Oswego; the first time Oswego held a nationally sanctioned triathlon. The sanctioning body was USA Triathlon, a group with more than 130,000 members. This was also the first time that a triathlon has been run though the city of Oswego. Schuyler Street was shut down during the duration of the event so that participants could run and bike safely though town.